More than a dozen incidents at college campuses across the nation in recent months illustrate how open support for Republican presidential nominee Donald Trump is a sure invitation to be bullied, censored or attacked. 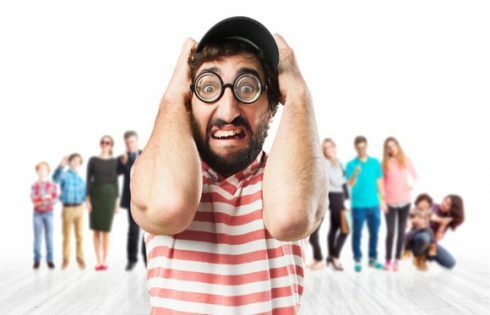 Left-leaning students and professors alike are working to shut down pro-Trump events and messages they deem unacceptable through a combination of fear, threats, ridicule, police intimidation and physical and verbal attacks. 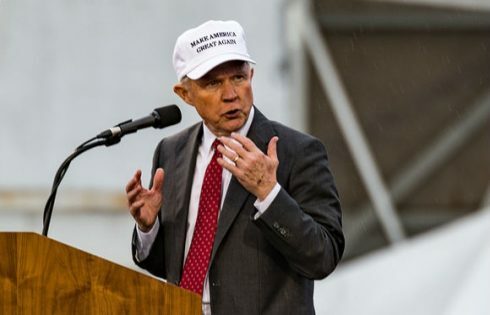 Claiming “hate speech” or “racism,” they use the system of victimization established on campuses to claim righteous indignation and quash free speech and freedom of expression — and all during the crucial months leading up to the presidential election. Fear of political violence should not be part of the daily reality for conservative and Republican college students, especially with the November vote less than seven weeks away, yet it’s clear this atmosphere is manifesting itself on campuses with no signs of abatement. Sept. 2016: A Columbia University student “outed” as a Donald Trump supporter is ostracized by students in his dorm, who refuse to speak to him or be in the same room. Sept. 2016: A student at Calgary’s Mount Royal University angrily confronts a fellow student with a “Make America Great Again” cap and demands he remove it and threatens to report him to the university for hate speech. 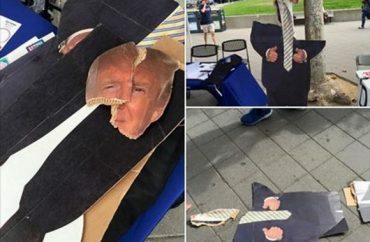 Sept. 2016: The Berkeley College Republicans’ life-size cardboard cutout of Donald Trump is ripped up by five bandits in the middle of the quad, just one day after other campus protesters attempted to aggressively swipe the GOP’s sign. Sept. 2016: Students at Appalachian State University erase pro-Donald Trump chalk messages and try and block peers from seeing them. Sept. 2016: A UNC Wilmington professor erases away pro-Trump chalkings drawn up by students — then brags about it on social media and says she’d do it again, calling the messages hate speech. Aug. 2016: Ripon College’s president, a politics and government professor, encourages his colleagues to disparage Donald Trump. 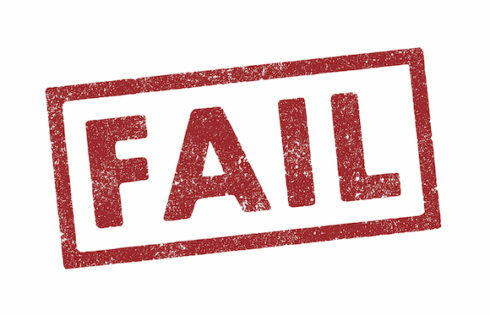 Aug. 2016: An associate professor of political science at Gettysburg College declares a Trump presidency “truly unthinkable as well as unteachable” and says she cannot offer a balanced approach on the Republican candidate inside her classroom this fall. May 2016: After a pro-Trump chalking, University of Illinois at Urbana-Champaign forces students to take “minority culture”’ class to graduate. April 2016: DePaul University’s Black Student Union accuses its College Republicans of a hate crime because they chalked pro-Trump and pro-Israel messages on campus. April 2016: Georgetown University Police Department investigates chalk on campus supporting Donald Trump, a border wall, a pro-police messages. 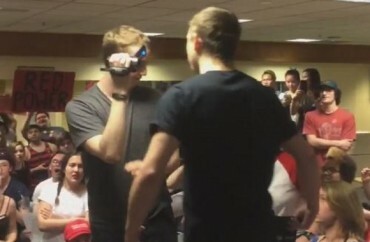 April 2016: At Portland State University, more than 100 left-leaning students crash the forming meeting for Students For Trump, where fights nearly break out. April 2016: Students at NYU are called “racist and fascist” for supporting Trump, and say they fear for their safety and grades. 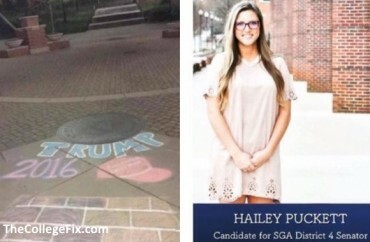 April 2016: A student senator-elect at the University of Tennessee at Chattanooga is asked to resign by members of her own campaign ticket for participating in drawing pro-Trump images in chalk on campus. These examples only represent a portion of such anecdotes; many more could be added to the list. Students claim they are traumatized by pro-Trump messages, hats or chalk messages with phrases such as “Make America Great Again” — calling it akin to racism and violence against people of color. The freedom of speech of students and the right to peacefully assemble are under attack as a result. Many altruistic calls for young people to participate in the voting and election process run up against this silencing and oppression of voices who support an unpopular candidate with the Left.